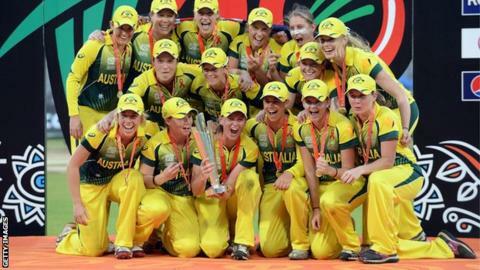 Australia thrashed England by six wickets to win a third successive Women's World Twenty20 title. England collapsed from 55-1 to post a modest 105-8 after losing the toss in Mirpur, with Heather Knight's 29 the highest score as Sarah Coyte took 3-16 and Ellyse Perry 2-13. Captain Meg Lanning's 44 off 30 balls hurried Australia to a comprehensive victory with 4.5 overs to spare. "We were completely outplayed," said England captain Charlotte Edwards. "We weren't good enough - 105 was never going to be good enough in a World Cup final." If the 2012 final between these sides was a close affair - Australia won by four runs - the latest meeting was anything but. England laboured with the bat on a blameless pitch, and the result was never in doubt once Australia raced to 43-1 after the first six-over powerplay. Jess Jonassen provided the early impetus before Lanning, the leading run scorer in the tournament with 257, hit four fours and two sixes. No England player, by contrast, managed a six in the entire competition. Neither Edwards nor opening partner Sarah Taylor scored freely during a stand of 23 that spanned almost six overs. Both fell to the impressive Coyte, Edwards caught by a tumbling Jess Cameron at mid-on and Taylor lbw attempting to reverse-sweep. Wicketkeeper Alyssa Healy's diving catch accounted for Lydia Greenway, Knight was well held by Perry, running in from deep mid-wicket, and England limped to three figures as four wickets fell in the last five overs. Left-hander Jonassen set the tone for Australia's reply by taking two fours and a six off the second over, bowled by Danielle Hazell. She drove to mid-on in the next as player of the tournament Anya Shrubsole took her wicket tally to 13, before Jenny Gunn removed Elyse Villani. But Lanning ended England's faint hopes of repeating their 2009 triumph during a third-wicket stand of 60 with Perry, who finished 31 not out. That Lanning and Alex Blackwell fell in the space of three balls shortly before victory was sealed was irrelevant.